Uniting men and encouraging them to seek a relationship with God by serving Jesus Christ in their home, church, career and community. Teaching others to be men of God through Christ centered meetings. Strengthening faith through the power of the Holy Spirit. Encouraging and praying for men in need of God's love, mercy and grace. Demonstrating God's love through fellowship, prayer and adoration. Serving Christ and one another by fishing for men with nets of hope, faith and love. Getting together because of Christ. Growing together in Christ. Going forth to serve Christ. 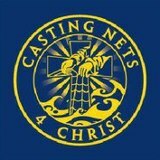 Fishing and Casting Nets 4 Christ. "As iron sharpens iron, so one man sharpens another." Proverbs 27:17"
CN4C will establish a place where men can come together to praise and worship our Lord Jesus Christ in fellowship with the Holy Spirit. A place where hearts can be Mended, for those who are hurting; to find Peace in a world that is full of sin and wants us to look away from the things of God; and to (re)discover the Love of Jesus Christ for those who are lost. A place where we can come, listen, share and learn about the Good News and our mission in this life. To provide opportunities for personal growth in knowledge, service and love for our Lord Jesus Christ, by using the gifts given to us by God to further the advancement of his Church.